Hiking in winter takes a little more prep and planning - but with the right gear and the right attitude, it is worth the extra layers and (in this case) sub zero temperatures. Not only is this canyon worth the scenic drive, but you get to enjoy one of Banff's most famous hikes without the crowds of summer. 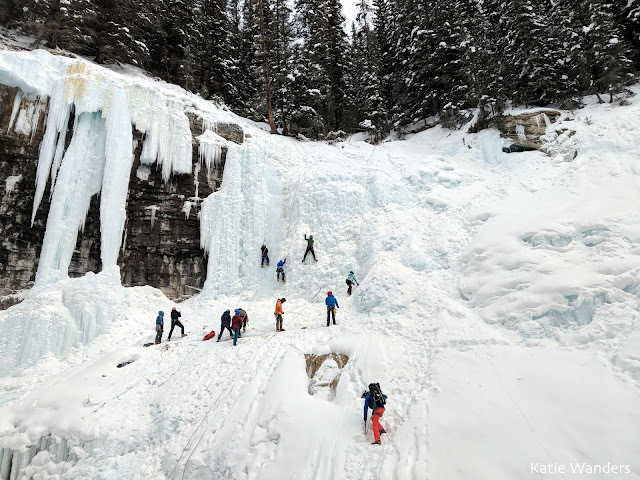 More gear, less people, and a whole different perspective of Canada - a winter hike to Johnston Canyon is a must do when visiting Banff. 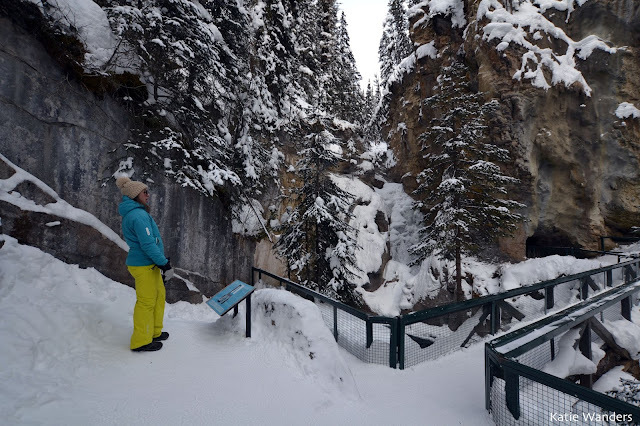 Johnston Canyon takes winter travelers down a snowy trail with iced canyon walls and frozen waterfalls. A 20-minute walk (1/2 mile) will take you to the lower falls and if you have the time, another 25 minutes (for a 45 minute total with a one way trek of 1.5 miles from the start) to the upper falls (elevation gain of 120 meters) one way. The trail is well maintained and marked, and follows a steel catwalk and raised trail through the canyon. There are several lookout areas, benches, and various signage along the trail with information about the canyon and this unique environment. 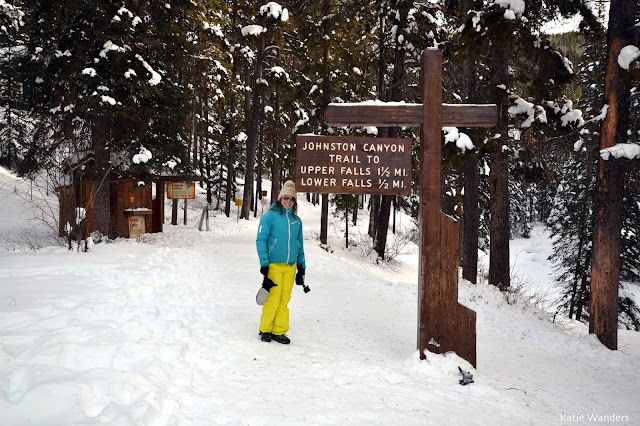 You will follow Johnston Canyon Creek which runs its course through the canyon, mostly frozen, and exposed in certain spots. 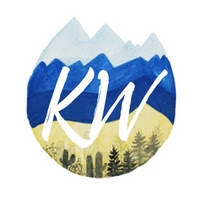 In the summer, this hike looks absolutely beautiful with lush green forests, canyon walls, and a turquoise creek running through the canyon. But in the winter, you step into Frozen Territory- frozen waterfalls, snow covered trails, and an icy canyon. While the winter brings more solitude, it does demand more planning. During the winter, you need to pay a little more attention to trail conditions for this hike. 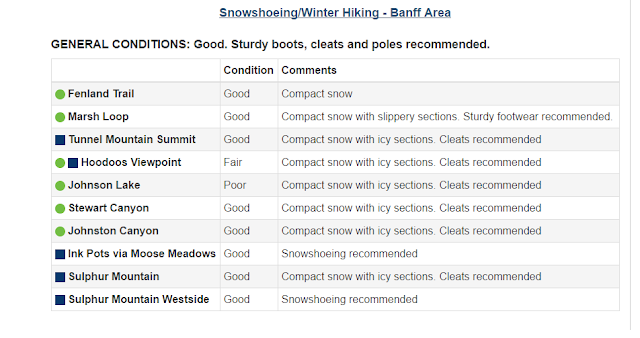 Thanks to Parks Canada, there is a great website where you can check trail conditions. At the time of my hike, the trail conditions were "compact snow with icy sections, cleats recommended". We managed to get by without cleats (or microspikes). Yes they would have been helpful but we managed to hike to the upper falls and back without microspikes, just in a good hiking shoe with good traction. This is not a "sneaker hike" in the winter, so make sure you have a good waterproof hiking boot. 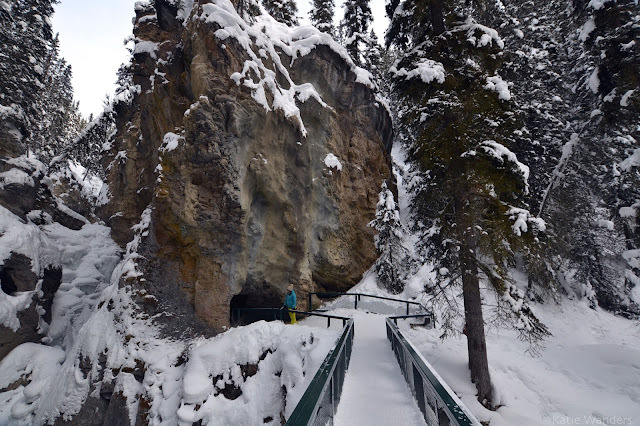 This trail is still popular in the winter as tour groups take visitors to Johnston Canyon for a winter hike. My advice? Get there early. We started this hike at around 9 am and saw only 1 or 2 people on our hike in. During our hike out, we saw several large groups entering the canyon and making their way down the trail. If you want solitude, make sure you are at the trail head before 9 am. In the summer, you can find several large parking areas, bathrooms, a restaurant, ice cream stand and gift shop at the base of the trail. You can also rent a cabin/stay at the lodge in the area. But in the winter, you are on your own as far as supplies. There is a well maintained parking lot and bathrooms open at the trail head but you will have to bring your own snacks and water. There are no fees associated with this hike. Parking and admission into the area is free. 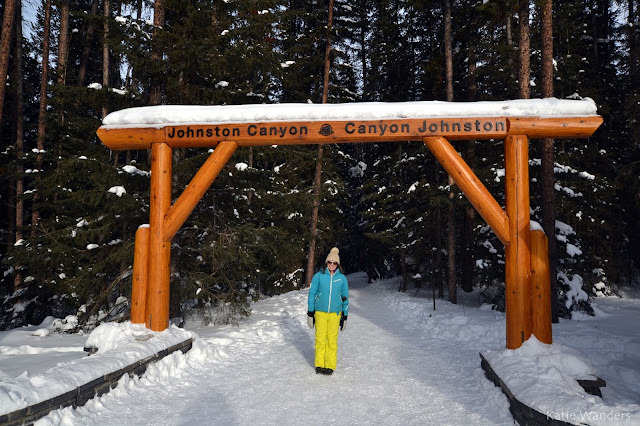 Getting Here: Follow the Bow Valley Parkway west from its eastern interchange with the Trans-Canada Highway 17.5 km (11 mi) to Johnston Canyon. There are several parking areas which goes to show you how busy this trali can be in the summer. You will find the main parking area on the east side of Johnston Creek. You will find the trail from the rear of the parking area. The trail will take you across a footbridge to the lodge and trail head on the west side of the creek. 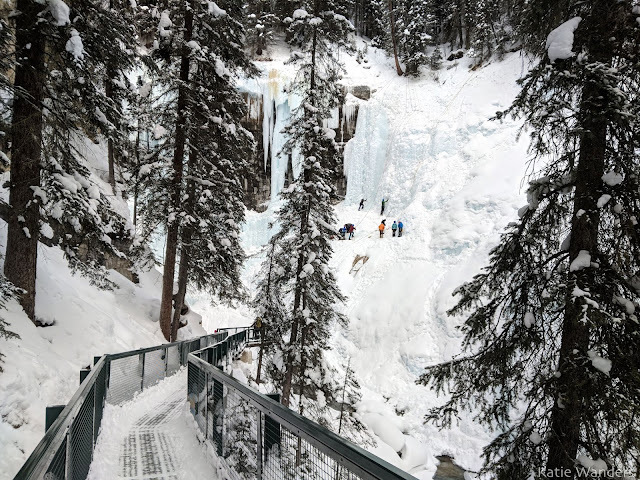 Lower Falls: To get to the lower falls viewpoint, you will cross a bridge across the creek before traveling through a short tunnel to see the waterfall (frozen at this time of year). If you head back to the main trail and continue towards Upper Falls, you will also get great views of Lower Falls. Upper Falls: There are two viewpoints to see the upper falls. 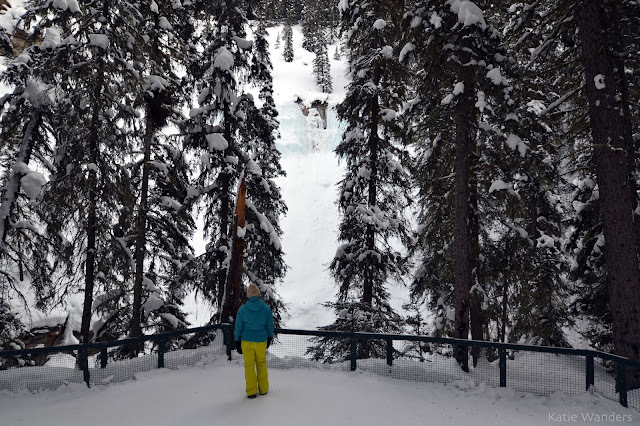 You can follow the catwalk to see the bottom of the falls via a viewing platform. Once you head back to the main trail, you can see the second viewpoint, up a short steep climb to the top of the falls to another viewing platform over the gorge above the waterfall. 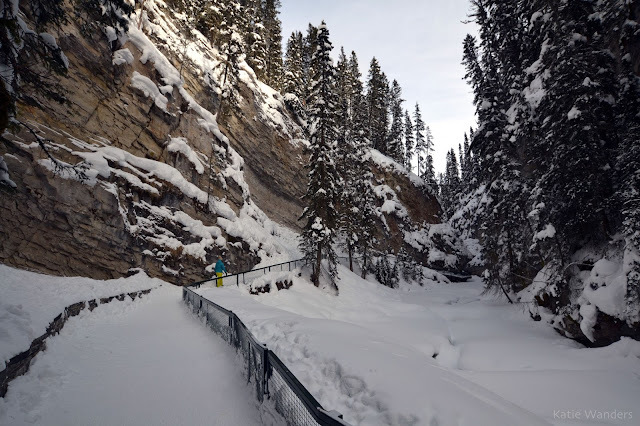 This hiking trail takes you through Canada's beautiful canyon walls, past frozen waterfalls, winding along the Johnston Canyon Creek. 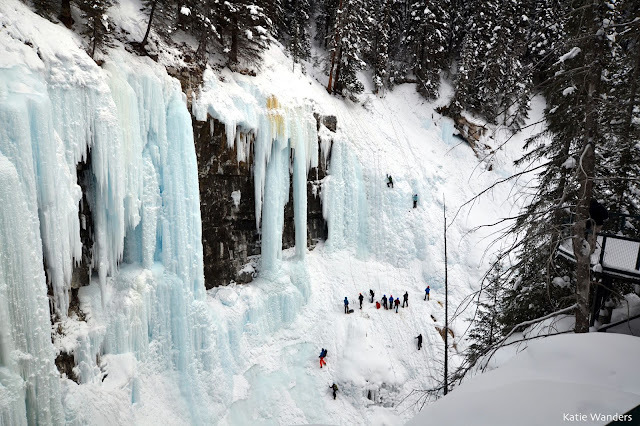 By the upper falls, you can find ice climbers, making their way up the upper falls. This is a well marked trail, easy to follow with great views and overlooks along the way. 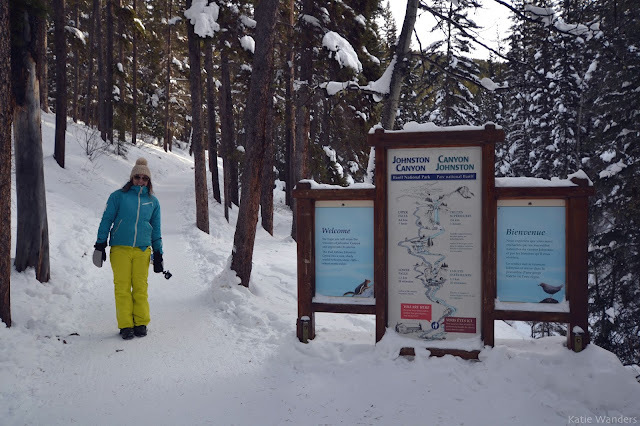 If you are looking for a great winter hike in Banff, Johnston Canyon is a great option to see famous Banff in a different light - frozen and quiet.